This newly listed 2 bedroom apartment in Astoria, off 13th street close to Broadway. The unit is top floor of a 2 family brick townhouse features excellent natural light, locking outdoor gate for extra sense of security. Private entrance straight to your apartment upon entering. Two equal sized bedrooms (with modest closets) fit queen beds, inserts for a/c so you dont have to put them in windows. 6 foot deep 3.5 feet wide storage closet off living room great space for bikes or camping gear. Manhattan skyline view including empire state building from living room. Wall to wall brown (medium pile) carpet throughout...except kitchen/bathroom. Bathroom total renovation being finished as I write. Full size appliances with gas stove. 5 minute walk to Socrates park ( farmers market/ coffee shop in park), also Rainey park (riverfront path with spectacular views), In between both is a Costco with attached liquor store. Ample bus lines nearby (21st st q69 / N train 10+ minute walk to Broadway station depending on leg size with all the restaurants, grocery's, gyms, and banks you could want. Handy owner lives on bottom floor, so wannabe drummers and punk rock addicts need not apply. Also small dog maybe allow depending on size......This is a great deal for the right person, heat and hot water included. See photos and floorplan for further details on layout. Apartment is available immediately. 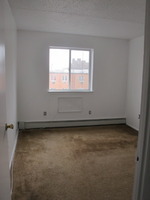 Call Maria to view: 347-248-5825.